At school, Hans Otto knew Erich Kästner. He debuted in 1921 at the Künstlertheater at Frankfurt am Main under A. Kuckhoff as Ferdinand in "Kabale und Liebe". In 1924 he became a member of the German communist party KPD. He worked at the Preußisches Hoftheater in Gera (1924-1926) and the Deutsche Schauspielhaus in Hamburg (1926-1929) before he moved to Berlin where he was engaged at the Lessing-Theater and the Preußische Staatstheater at the Gendarmenmarkt. When the great actress Elisabeth Bergner met him in 1930 before they would appear in a play she felt there was something strange and magical about him. 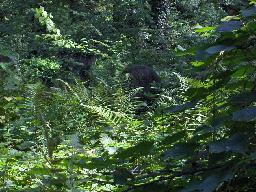 They went out for a walk without speaking a word. They both were involved into a relationship at the time (Otto was married) and Bergner claims in her autobiography that nothing more happened between them. But according to Klaus Völker (who knew Bergner personally and published a book on her in 1990) they had worked together a few years before as well and at that occasion they had fallen in love with each other almost immediately. It remains unclear if they had an affair at that time. For political reasons Otto had refused to play in the movie "Fridericus Rex" and the Staatstheater fired him on 27 Feb 1933. Max Reinhardt offered him a position in Vienna, but he stayed in Berlin, where he was busy the with now illegal activities of the KPD. The nazi's arrested him on 14 Nov 1933 at a cafe at the Victoriaplatz in Lichterfelde. During an interrogation at the SA head quarters at the Voßstraße in Berlin he 'fell' out of a window and died soon afterwards at a hospital. Werner Hinze was arrested together with him and afther the war he wrote an account of Otto's last days. 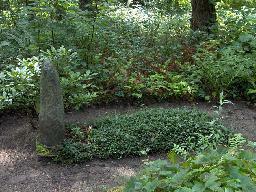 Hans Otto was buried secretly at the Wilmersdorfer Waldfriedhof at Stahnsdorf, where his grave can still be found. However, in 2005 the journalist Peter Hahn reported in the local press that Berlin is planning to turn a part of this beautiful cemetery into a park. Since Otto was never formally recognized as a nazi victim his grave is no grave of honour and there is a danger that it would be removed. So far this didn't happen. The theatre in Potsdam (near Berlin) was named after him. 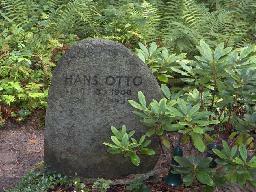 The grave of Hans Otto at the Wilmersdorfer Friedhof in Berlin.